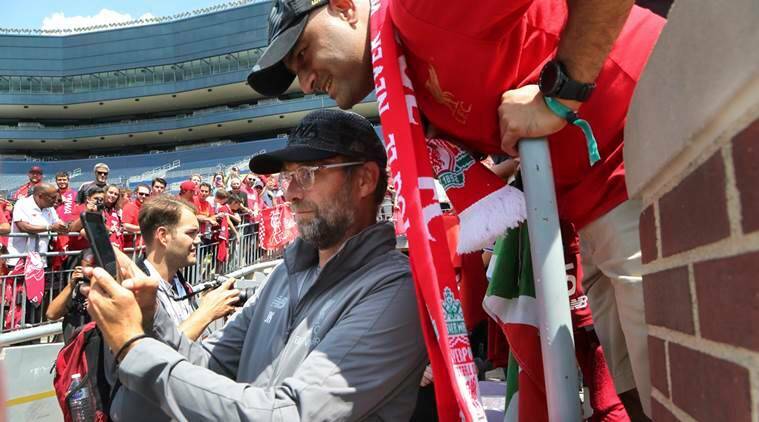 Liverpool and Manchester will face each other in a pre-season game in Michigan on Saturday. Manchester United manager Jose Mourinho, at a press conference earlier in June, said the pressure will be on the Reds manager to win the Premier League title after spending £175million on four new players in the summer transfer window. Ahead of the meeting between the two teams at a pre-season game in International Champions Cup in Michigan on Saturday, Klopp denied Mourinho’s claims. The German further joked that he wants to make Mourinho smile. “One of my biggest goals in life is to make Jose smile – it doesn’t happen very often,” Klopp was quoted as saying by The Independent. The 51-year old further added that he will not discuss Manchester United unless he is asked about it. “I don’t even think it is a mind game, I think it is normal. I would never talk about Manchester United if no-one asked me about it,” he said. Klopp further added that he knows buying good players does not automatically convert into results. “I have no problem with what Jose Mourinho is saying, it is a free world and he can say whatever he wants. If he is happy about our transfers even better. We know it doesn’t mean you win (trophies) automatically,” the Liverpool manager said. Liverpool will be entering the clash against United on the back of a 2-1 victory of Premier League Champions Manchester City. United, on the other hand, had to fight hard to register a win against AC Milan in their previous fixture, which ended with a 9-8 scoreline on penalties. The Liverpool manager further added that the referee should make a better call in such circumstances. “I saw the ref taking charge of big games at the World Cup and nobody really thinks about that later. But in a situation like that somebody needs to judge it better. If VAR is coming then it is a situation where you have to look again. Not to give a red card but to look again and say: ‘What is that?’ It was ruthless,” he said. The former Borussia Dortmund manager added that he did not like Ramos’ reaction after the incident. “Ramos said a lot of things afterwards that I didn’t like. As a person I didn’t like the reactions of him. He was like: ‘Whatever, what do they want? It’s normal’. No, it is not normal. If you put all of the situations of Ramos together then you will see a lot of situations with Ramos … It is like we, the world out there, accepts that you use each weapon to win the game. People probably expect that I am the same. I am not,” he said.